Important news from Australia is not scheduled for release this week. However, attention should be paid to the data on sales of new houses in Australia in April, which will be known on Wednesday. Indicator “Williams’ Percent Range” with the period 30 is in the oversold zone with the figure of -86. Moving average line with the period 70, which can act as an additional support level for the price, is located at the level of 0.9215. 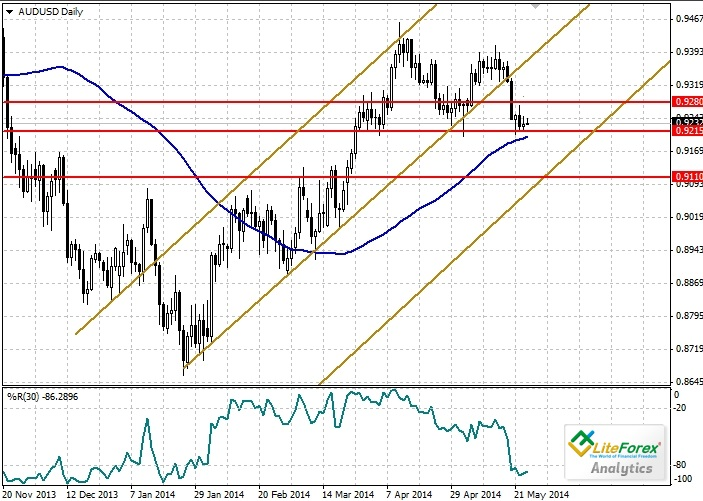 It the near future the Australian currency may experience upward correction to the level of 0.9280. From this level the price may reverse and decline to the levels of 0.9215 and 0.9110. The nearest resistance level is 0.9280. The nearest support level is 0.9215. With consideration of possible correction to the level of 0.9280, it is recommended to open short positions from the level of 0.9240 with stop-loss at the level of 0.9280 and the target of 0.9110.